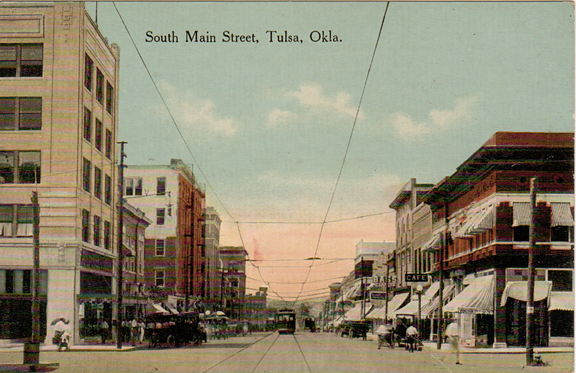 Last month I had the pleasure of presenting one of the museum's programs to the Tulsa Postcard Club. This wasn't my first time in meeting with these nice people. In fact, I don't normally do evening presentations any more, unless it's for a special group such as this. Postcards are an extremely important link and record to our past. 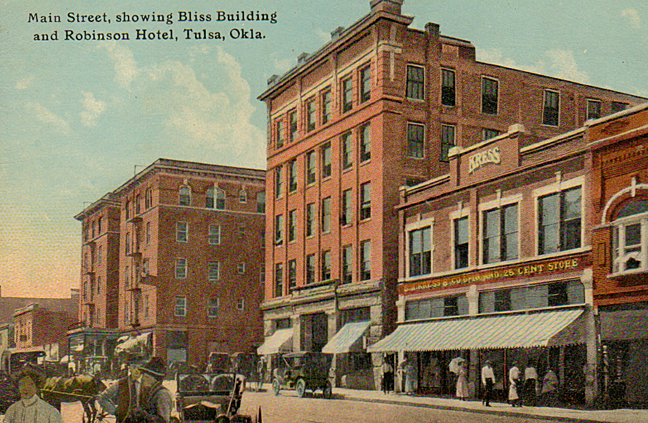 I only came to realize just how important when I began piecing together my first Tulsa History presentation about our old movie theaters. 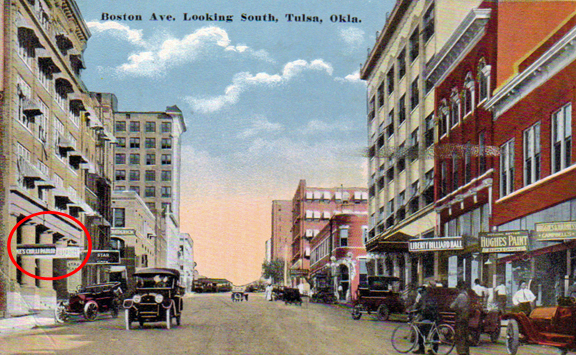 Photos of the long-lost gems are hard to come by, but street views in postcards are out there and plentiful. I have picked out some postcards to share with you here in no particular order. Hope you enjoy! 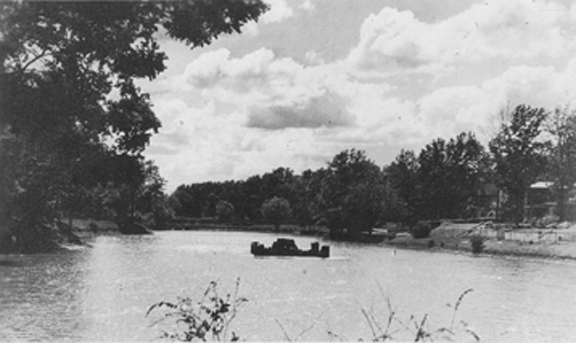 A blog entry from 2009 focused on pioneer Chauncey Owen and how the pond in Owen Park came to be. 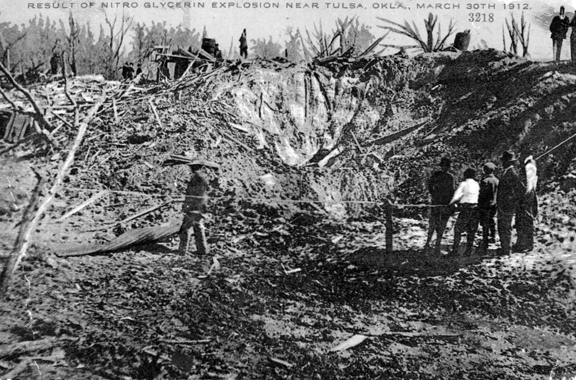 Here is an actual photo postcard of the event afterward. 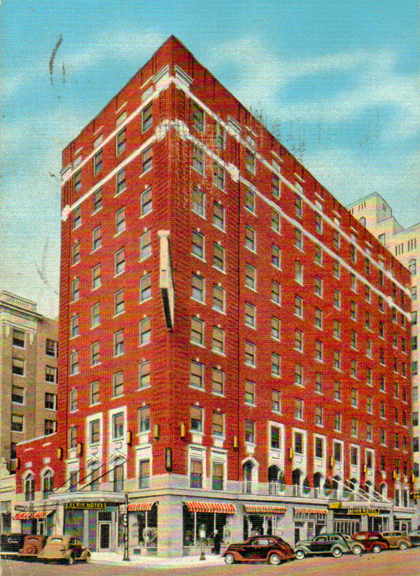 Minck's Hotel (now known as the Adams Hotel). 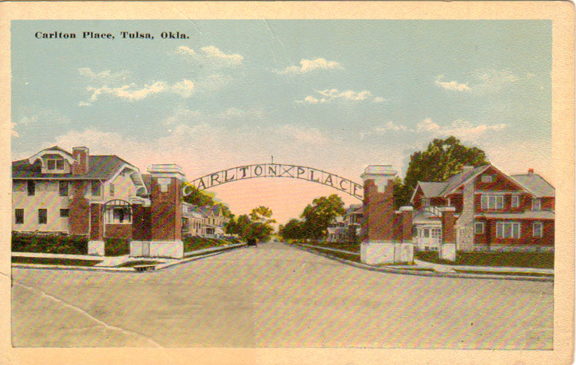 To read more about Carl Magee's contributions to Tulsa (including Carlton Place Addition) click HERE. 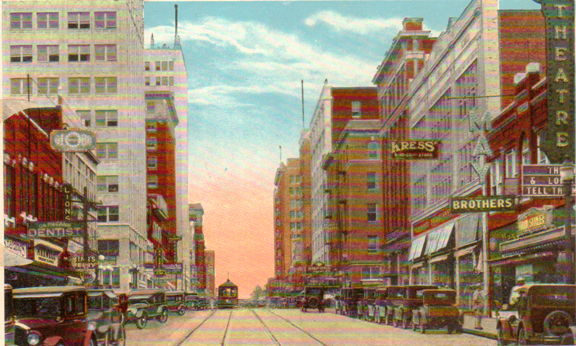 Kress Store and the Main Street Theatre on the far right. Tulsa’s third Methodist Church, then known as the Methodist Episcopal Church South, purchased a lot on East Second St between Cincinnati and Detroit in 1897. 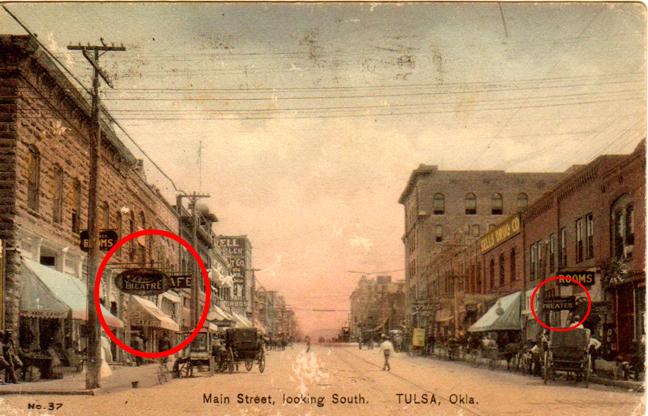 In 1901 the congregation sold that land and purchased a lot on the corner of Second and Cincinnati where they built the first brick church building in Tulsa. 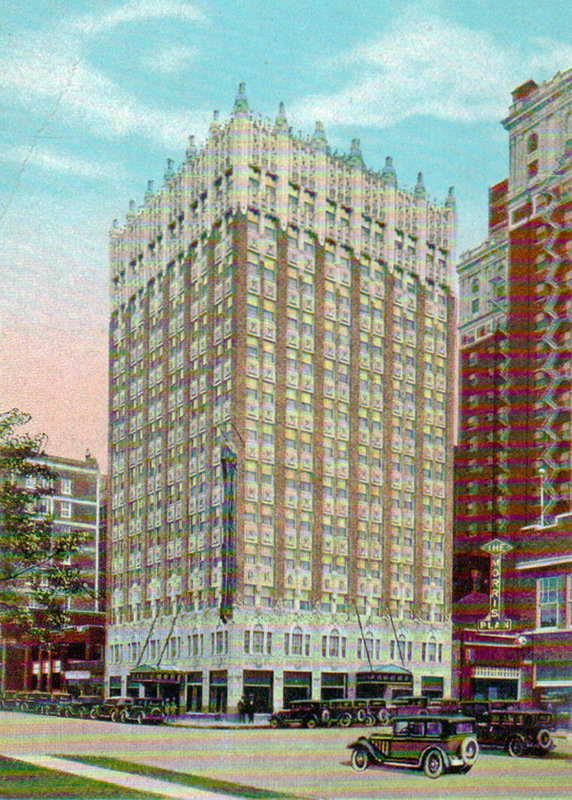 They stayed in this building from 1901 until 1907 at which time the land was sold and a new home was built for the church at 5th and Boston. They built an impressive two-story brick church and changed their name to Boston Avenue Methodist Church. The year was 1908. Services were held in this church for twenty years. 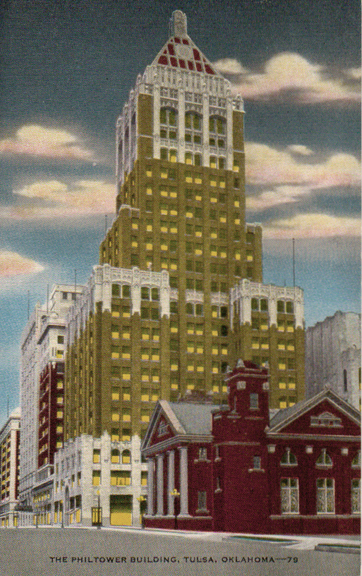 The congregation began to feel cramped when the Philtower was constructed in 1926. The Methodists sold their property to Waite Phillips and purchased land at Thirteenth and Boston. The last service was held in the church on 5th and Boston Sunday, October 14, 1928 and the congregation then moved to their beautiful art-deco style church. Especially like the photograph of the aftermath of Mr. McDonald's unfortunate accident. What a great collection of post cards and photos. Brings back some childhood memories. 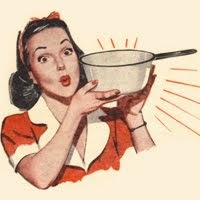 I can still smell the roasted peanuts at Kress department store. I'm wondering if you have (or need) information on the Philtower Building. 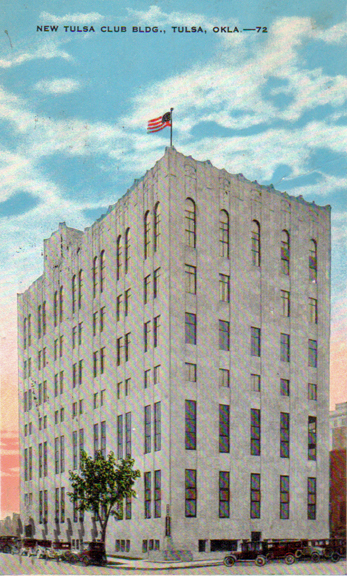 It was completed in 1928, and put on the National Register of Historical Buildings in 1979. My grandfather was head of construction on that building. When it was completed, Waite Phillips asked him to stay on as building maintenance foreman (since he knew the location of every pipe, screw, nail and brick). My granddad agreed, and took care of the building until he retired. Fun postcard views you've posted. Just wanted to point out an error. 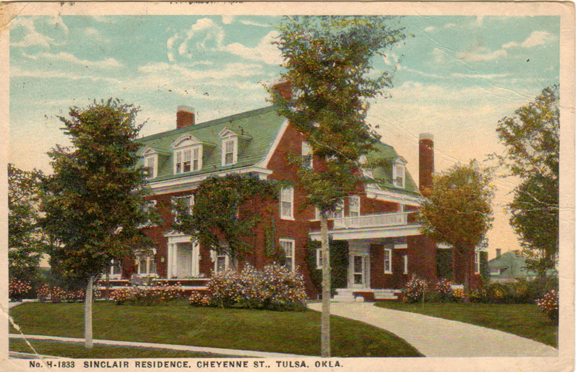 Fifth postcard down labeled S.H. Kress; the theatre shown on Main St., next to May Brothers & across from Globe Clothiers, is the Main Street Theatre, not Rialto. Thought you'd like to know. Got it corrected- thanks Jeff.